We’re always working to improve our tools, and recently overhauled our question search UI to make it easier for you to find a great Big Question for your next SOLE session. I wanted to take a few minutes to highlight some of these changes and help you get familiar with our new layout. We’ve redesigned search to focus on the most important things teachers are looking for: great questions in your subject area and grade. Our new search interface puts these front and center, while still allowing you to drilldown to the standards level if you’re looking to cover a specific content strand or standard. You can now preview how many questions will be available at every level of your search, making it easier to balance when you want to stop refining your search criteria. It’s now even easier to filter by keyword, standard, or saved/created questions. All search filters are available with a single tap just above the keyword field. 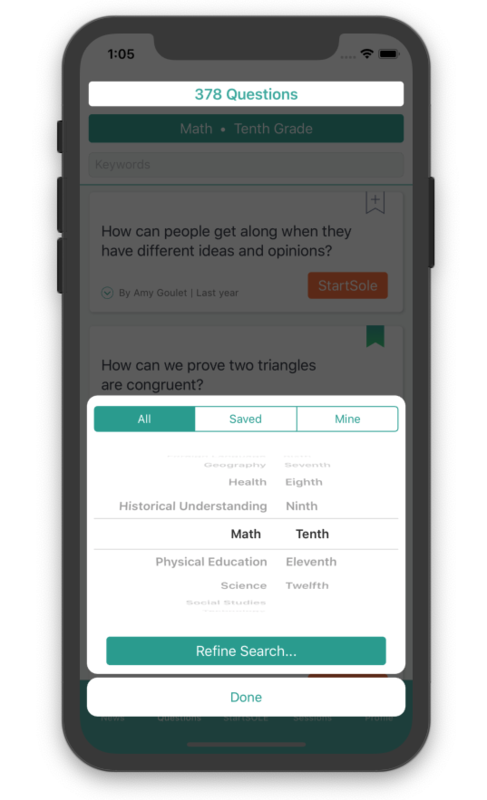 Quickly switch between a list of question cards and our picker mode for question review. You can now flip between these options seamlessly without having to return to the main menu. Our new standards refine interface means you will get the full text version of each standard, not just the shorthand codes. This makes it easier to read and contextualize your search rather than having to know you’re looking for HSG-GPE-B.5 you can read the full text version and know your students will be learning about parallel and perpendicular lines. As usual, we’d love to hear what you think, check out the new release here and contact us with your feedback.